ANDY LEE: "HOPEFULLY I CAN WEAR HIM DOWN AND GET A STOPPAGE"
"I see the fight being a tactical bout early on. I'm the stronger of the two so I will definitely use my physical strength to my advantage in regards to keeping him off me and hopefully I can wear him down and get a stoppage later on the fight. In my eyes, I know I'm going to win the fight and I'm prepared for a tough, hard fight," stated middleweight Andy Lee as he talked about his upcoming March 12th showdown with Craig McEwan. Check it out! JA: How's training going for your upcoming fight against Craig McEwan? AL: Training is going really well with less than three weeks to go before the fight. We're narrowing training down a little bit. I've been sparring with Demetrius Andrade and Mark Tucker; a lot of good sparring work I've been getting and I'm looking forward to the fight. JA: Will this be the toughest fight of your career? AL: I think so, with the fight being on HBO and the fight giving me a big marketing exposure. I did fight on some big stages against fighters who were talented, but I would have to say that this fight will be my toughest fight. JA: Do you feel a lot of pressure going into this fight? AL: No, but there is always pressure going into the fight because you don't want to lose. You have two young up-and-coming fighters going head to head against each other. I think there is always pressure, but it's something you get used to and all you can do is focus on the fight. JA: What did you learn from your loss to Bryan Vera? AL: I had him hurt in the first and I went all out to finish him and ended up punching myself out. Now, I've matured and improved my defense a lot; that's what I learned from the Vera fight. 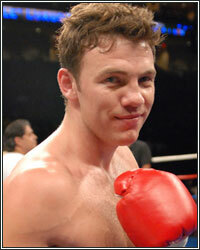 JA: With a win over Craig McEwan, do you feel it could propel you to be a contender in the middleweight division? AL: Definitely. The winner of this fight will be in line for a title fight down the line. This is a big fight and I know what's at stake. JA: With three weeks to go before the fight, how do you prepare your mind going into a fight of this magnitude. AL: I'm relaxed and I'm watching movies. I have the fight planned out in my mind and I have a regime that I go through in the dressing room. I'm relaxed. JA: Will it be difficult not having Emanuel [Steward] in your corner? ES: Any time you have Emanuel in your corner, it's a big bonus. Jalen Hill will be working my corner the night of the fight. Jalen and Emanuel have been around each other their whole life and they both have the same outlook on the sport of boxing. We all know the game plan and I'm very comfortable having Jalen in my corner. JA: How do you see the fight going on March 12th? AL: I see the fight being a tactical bout early on. I'm the stronger of the two so I will definitely use my physical strength to my advantage in regards to keeping him off me and hopefully I can wear him down and get a stoppage later on the fight. In my eyes, I know I'm going to win the fight and I'm prepared for a tough, hard fight. JA: I know there will be a lot of fans from Ireland tuning into the fight on HBO. Is there anything that you want to say to them and to your fans at home? AL: Thank you all for supporting me. I know that there will be a lot of Irish Americans in the crowd on March 12th. I would like to thank my fans for sending me letters in the mail. It's nice to know that you work hard and the fans greatly appreciate the work you do.